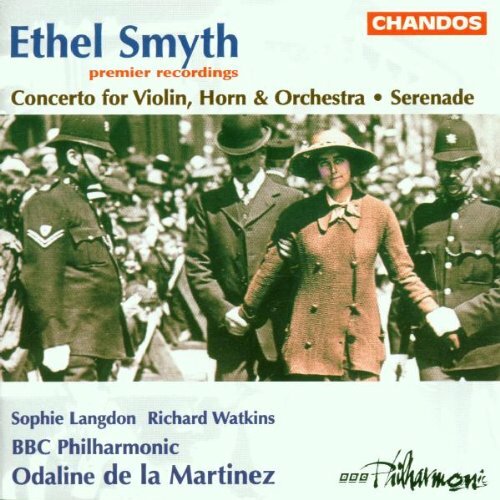 I’ve found what I think is the best available music by Ethel Smyth: this recording of her Serenade in D (1890) and Double Concerto for Violin and Horn (1927). (Pardon the generic suffragette image on the CD cover, kind of a cheap shot.) Curiously, the Serenade marked her debut in the London music world, and the Double Concerto was one of her last works as she succumbed to deafness. Her Mass is magnificent, but liturgical works don’t leave as much room for personality. The Serenade is melodious and varied enough that I’d rather hear it than Brahms’s two works in that genre. The Double Concerto is remarkably delicate and memorable, and rather Holstian – though she was Holst’s senior by 16 years – and a stronger and better thought-out work than Holst’s Double Violin Concerto, to name an obvious comparison piece. Although I like that too. Holst and Walton have long been my favorite English composers, and Smyth now officially joins them. She deserves far more attention than she gets. Interesting. Odaline was briefly a student of mine at Tulane ca. 1968. A very nice person and, as I recall, a talented composer. That Mass of hers is a goldmine of grad exit exam material. So, what do you think of Bax? KG replies: I give him a big chance every few years, have even bought some scores, and he never makes much of an impression on me, positive or negative. Am I missing something? KG replies: Yes. I enjoyed the Elgar once too, but it’s a little hard to get room for uninterrupted listening experiences during the holidays. I played Smyth in my car, which is the acid test. I’m pleased to report that I found the Smyth CD on Spotify (speaking of 21st C approaches!) and enjoyed an initial listen, though I share with you the problem of getting time for uninterrupted listening during the holidays. KG replies: Here I go, forgetting to check YouTube and using the word *available* as though the corporate world still controlled everything. I can’t be dragged into the 21st century.